Last Wednesday was one of those epic days. It was the last day of school, with Darya's Pre-K graduation, a ton for me to do during the day, and a rush from the schoolyard to the airport to catch our evening flight to Orange County for the Cars Land grand opening. I hustled all day, and I don't think I sat down for a minute unless I was in some form of transportation. 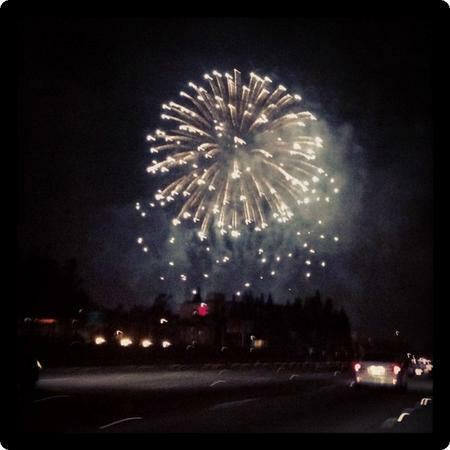 So on this day, to have the fireworks explode overhead as we drove towards Disneyland and our hotel room felt like the perfect celebration of the day, our school year, and the beginning of summer vacation. walkingon travels on June 21, 2012 at 10:50 p.m.
What a fantastic way to end the school year! Sonja on June 22, 2012 at 9:05 a.m.
How exciting to see Cars Land already! Heard it's great! travel and vacation destinations on June 23, 2012 at 12:39 a.m.
What a remarkable end of the school year.. this is great! Martin Pietrzak on June 23, 2012 at 9:28 a.m.
Is there any particular theme in Photo Friday posts ( I noticed a couple of posts were about fireworks)? I think it's a great idea and would love to participate. Please let me know. Glennia on June 29, 2012 at 11:33 a.m. I'm sorry I missed seeing you at the Cars Land opening! It was so crowded, I was lucky to find anyone. What a great event!